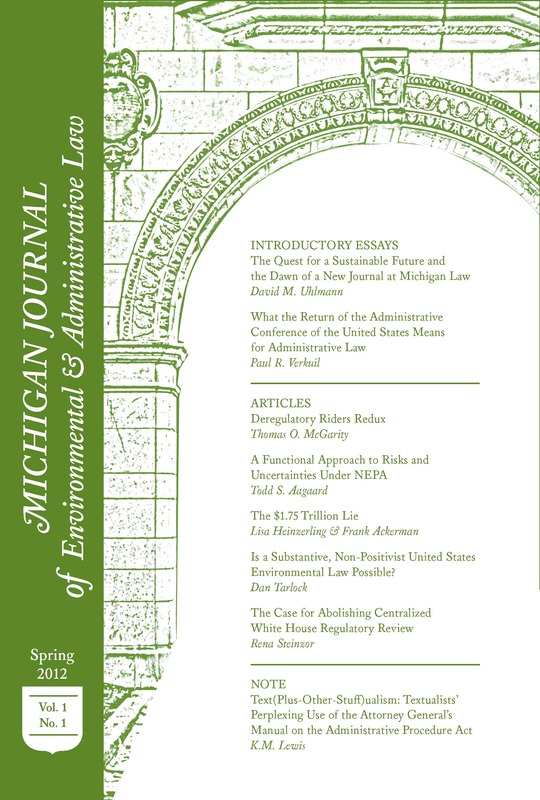 The Michigan Journal of Environmental & Administrative Law (MJEAL) is The University of Michigan Law School’s newest legal journal. MJEAL is made possible by a generous grant from the Graham Sustainability Institute at the University of Michigan. The journal publishes articles, student notes, comments, essays, and online blog posts on all aspects of environmental and administrative law. An associate editor’s main responsibility on MJEAL is below the line editing. Associate editors have one week to complete sourcegathering and citechecking assignments. In addition, associate editors are expected to complete a note to be considered for publication. Associate editors regularly meet with their notes editors to assist in this process. MJEAL begins accepting associate editor applications during the spring write-on. A completed application requires a resume (one page), statement of interest, note proposal, citechecking exercise, and writing sample (10-20 pages). Specific information about this year’s write-on will be posted when available. A junior editor’s main responsibility on MJEAL is writing original posts for our blog. Junior editors will be expected to complete some sourcegathering and citechecking assignments. MJEAL begins accepting junior editor applications from 1Ls in the fall. A completed application will include a resume (one page), statement of interest, blog proposal, and writing sample (10-20 pages). MJEAL welcomes you! Please email Emily Van Dam at emvandam@umich.edu to discuss the application process.